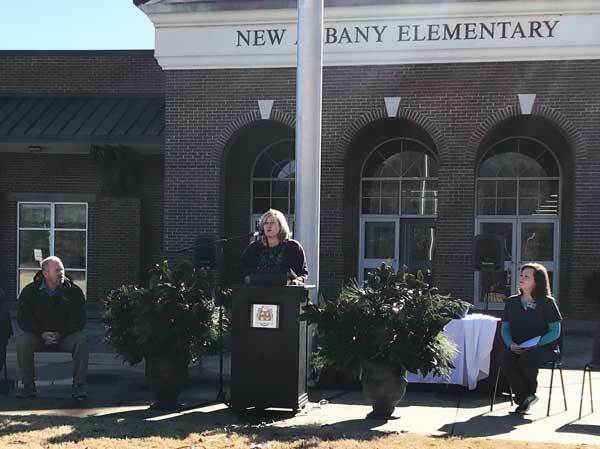 A formal groundbreaking ceremony was held at New Albany Elementary School (NAES) on Monday, December 17 to kick off the School Garden Project at the school. Several community members and school officials attended the ceremony to show support for the project. The $120,000 School Garden project is being funded through a grant from the Blue Cross & Blue Shield of Mississippi Foundation. The ceremony included holiday selections from the NAES 5th Grade Chorus and a welcome from Principal Gwyn Russell. “The Blue Cross & Blue Shield of Mississippi Foundation grant is an elite privilege, and we have an extraordinary opportunity to enhance our campus, as well as the physical and emotional health of our students and staff,” Russell stated. Principal Gwyn Russell welcomes the guests to the groundbreaking and extends a special welcome to students who are watching the ceremony via live streaming. • Develop a school culture of health and wellness by increasing health literacy resulting in individuals taking accountability for their own health. • Increase sustainable healthy nutrition habits of school personnel, students, and their families by increasing awareness of the importance of eating healthy foods. • Increase students’ knowledge about growing vegetables and fruits. • Incorporate the garden into the school’s curricula. • Improve behavior of students and the morale of teachers. • Improve academic performances of the school. Funding from this grant will be used primarily for the purpose of creating and expanding gardening projects on the NAES campus. Garden #1 will be the focal point in front of the school. What is now a grassy area separating the school building from the main parking lots will be converted into a park-like atmosphere that includes attractive landscaping and walking paths. Garden #5 will be an outdoor classroom located behind the school. This garden will feature amphitheater style seating and will encourage creativity through writing, drama, and technology. Reeder emphasized that the garden projects outside would serve as a visible reminder of the healthy lifestyles that are being encouraged and improved inside with students and staff. “Physical fitness, mental health, behavioral health, and nutrition awareness are all part of our plan to empower our students and staff to make more healthy choices,” Reeder stated. Mayor Tim Kent and Superintendent Lance Evans both provided brief remarks and participated in the official groundbreaking ceremony. Kent praised school administrators for putting forth the effort to apply for grant funding for this beneficial project. Evans also commended Principal Russell and Nurse Reeder for going the extra mile to secure funding that would not only beautify the school campus but improve the health and education of students. Participating in the official groundbreaking ceremony were: Mayor Tim Kent; Lance Evans, Superintendent; Gwyn Russell, NAES Principal; Emily Speck, NAES Assistant Principal; Tammie Reeder, BSN, RN, NCSN; and April Hobson, Counselor.